The Little Sisters of Nazareth have had a family of three nuns stationed in Lebanon since 1971. Sister Anita and Sister Rosa have served for four years, while Sister Joanna arrived a year ago, though she has long experience in Lebanon. Based first in Jisr el Basha, the sisters left Lebanon briefly for the safety of Jordan after the camp was razed in 1976. But in 1978, the Pontifical Mission [CNEWA’s operating agency in the Middle East] approached the sisters and, to ease their return, offered living quarters in Dbayeh. With CNEWA’s support, the Little Sisters began their work at the camp in 1984. “There were no other organizations working here,” Sister Joanna said. Since then they have been joined by several aid organizations, including World Vision and Caritas Lebanon. Through CNEWA, benefactors have sponsored many of the camp’s needy children and also fund educational programs, emergency health care and even infrastructure repair, such as sheathing the camp’s open sewers. The sisters trace their roots to Blessed Charles de Foucauld, the French mystic and hermit who lived humbly in the Sahara desert and prayed to God, “I abandon myself into your hands, do with me what you will.” He desired to live among those who were “the most abandoned.” Today, this little band of heroic sisters continues to live out that spirit of sacrifice and surrender among the displaced in Lebanon — and CNEWA is proud to support them in their mission. Won’t you join us? Visit this page to learn how you can help. Syrian families, fleeing from various eastern districts of Aleppo, queue to get onto government buses before heading to government-controlled western Aleppo. The Syrian government offensive to recapture rebel-held Aleppo has prompted an exodus of civilians. Editor’s note: This year for #GivingTuesday, CNEWA is encouraging our friends to support our education programs, including those at the Dbayeh Refugee Camp outside Beirut. You can learn more about how to help on our special Giving Tuesday page. Below, Anna Fata, a friend and advocate of CNEWA who works with the Holy See Mission to the U.N. in New York City, describes visiting the camp earlier this year. On a recent trip to Lebanon to visit my family, I got to encounter some of the people CNEWA helps: a small number of the estimated 1.5 million refugees living in Lebanon. I visited the Dbayeh Refugee Camp on the outskirts of Beirut; it is home to more than 4,000 refugees, most of whom are Palestinian Christians. It is also home to the Little Sisters of Nazareth, one of many local congregations with whom CNEWA partners to offer relief and assistance to those displaced within the Middle East. I had seen enough pictures of refugee camps to expect the run-down buildings and rusted playground. But what I didn’t expect — and what truly surprised me — was the resilience and generosity I discovered among its residents. I visited in the summer, while many refugee children were attending one of the summer camp programs supported by CNEWA. The leader of the summer camp is a Palestinian refugee named Elias. He was born in Lebanon and has lived at the camp his whole life. The other summer camp workers were also refugees, many of whom recalled attending the camp in their childhood. For various reasons, Lebanese law prohibits refugees from working in professions such as law, medicine and engineering. As a result, unemployment is one of the major issues refugees face there. Elias, like many of the other camp workers, makes a living by serving the children in his community. The ongoing conflict in neighboring states has brought an influx of Syrian and Iraqi refugees into Lebanon, as well. Elias told me the Palestinian Christians who make up most of Dbayeh’s residents accepted the Syrian refugees — many of them Muslim — into their community with open arms, sharing resources and jobs. In a country where until recently most neighborhoods and towns were segregated by religion, the Dbayeh camp is an exceptional model of harmonious interreligious living. Despite cultural and religious differences, Syrian and Palestinian children learn and play well together at school, as their parents educate them and socialize together, as well. Despite their troubles, everyone I met treated me with characteristic Middle Eastern hospitality and warmth. The children offered me their snacks, and poor families who had little to give invited me in for tea. The more I learn about the situation of refugees in the Middle East, the more complex the issues facing these groups appear. I’m no expert on the Middle East and cannot begin to fathom solutions that would give the refugees a place of permanence. But I think there is an appropriate human response that we — whether Christians, Muslims, Jews, or none of the above — need to choose. It is a response that the Little Sisters of Nazareth are living every day. We can be part of the solution by following the example of the sisters and the refugees themselves — to respond with the same openness and generosity they have shown one another, despite differences in beliefs and culture. As we celebrate this holiday season with our own families, we need to remember those who will be far from home for the holidays — including those who are internally-displaced and cared for by local congregations in the Middle East. Some may even celebrate their first Christmas in a refugee camp, separated from loved ones they may never see again. The political and economic instability in Lebanon and surrounding areas makes the work of organizations such as CNEWA all the more vital. The refugees I met make up just a tiny fraction of the men, women and children CNEWA serves. There are so many more — and the needs are so great. This holiday season, please remember these and others CNEWA is working to uplift and support. Visit this link to learn how you can help. 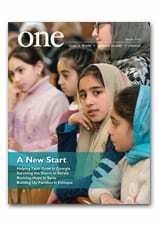 To read more about refugees in Lebanon, check out Lebanon on the Brink from the Spring 2015 edition of ONE. To learn more about the selfless work of the Little Sisters of Nazareth, read A Sister Act Hard to Follow. And take a moment to watch the video below for a poignant glimpse into the lives of refugees in Dbayeh. Holding a golden chalice and paten with a single hand, Father Remzi Diril slowly moved from one person to another, distributing the Eucharist. He reached for a consecrated host, dipped it in the chalice, and gave it to a woman in her 40s, whose head was covered with a veil. With chants in the background and incense filling the air, the moment inspired reverence. Yet the liturgy was not in a church; it was in an apartment in Kirsehir, a small, conservative city in the heart of Turkey, a Muslim-majority country. Being the only Chaldean Catholic priest in charge of pastoral work in Turkey, Father Adday, as he is known, has become a true itinerant priest, a road warrior who, each year, logs thousands of miles tending his flock, the community of Iraqi Christian refugees in Turkey. Their exact number is unknown, but it is estimated to be 40,000. Since he was ordained two years ago, Father Adday, 34, has baptized more than 200 children, married more than 20 couples and administered the Anointing of the Sick to more than 30 people. He also is on his fifth suitcase. “So far this year we have celebrated first Communion for more than 100 children. And last year it was more than 150,” he said. On a recent hourlong flight from his base in Istanbul to Nevsehir, a city in central Turkey, Father Adday sat comfortably in the emergency exit row of a plane from a low-cost airline. “There is more legroom here,” Father Adday said; his eyes locked on the airline’s magazine crossword. The trip’s cost is an important factor considering that the church is not able to reimburse his expenses. That only happens when there is an official function or religious festival. More often it is the priest, or the families he visits, who pay for the trip. “It is easier for them to help me with my travel expenses than to pay, for a family of 10, for a trip to Istanbul," Father Adday explained. Once he arrives at his destination, the priest relies on a support network who connects him to the local community of Iraqi Christians. From Nevsehir Father Adday took a 60-mile bus ride to Kirsehir, where he met Adnan Barbar and his wife, Faten Somo. This was the priest's eight time in the city. “This is my family in Kirsehir. In every city, I have a family. Sometimes more than one,” he said. The couple acts as Father Adday’s local liaison. After welcoming the priest to their apartment with the customary tea and sweets, Barbar and Somo got on their cellphones. They were familiar with the city’s 225 Iraqi Christian families, and they were assembling the priest’s itinerary. This area of Turkey is a pivotal place in the history of Christianity. Early Christians came here escaping persecution in the Roman Empire. Remains of the churches they built can still be visited today. However, no Catholic churches function in this part of the country. And when Father Adday visits, Mass is celebrated in homes, as the early Christians also did. Celebrating the liturgy in a public hall would allow more people to attend, but renting a hall costs about $900, which can be better spent traveling to visit more families. On average, 10 families are invited to each Mass, and 30 people attend. This allows for an experience different from the one felt in a church. After the liturgy, the priest visited Marta Kiryakos, a woman from Bartella, Iraq, suffering from cancer. Her daughter, Nadira, opened the door of the bedroom, crying, worried about her mother's health. Kiryakos' condition is delicate, and the priest prayed for several minutes as he anointed her temples and forehead with oils. Many of the people Father Adday visits have spent several years in Turkey, waiting for an answer to their asylum applications to countries such as Australia, Canada and the United States. The process is long, and this time in limbo has caused many people physical and psychological problems. “People need spiritual help. They need a priest. They want the church with them. I can’t give them material things, but I can give them my time and give them hope,” the priest said. Father Adday and the Iraqi refugees he serves are Assyrian, an ethnic group from the Middle East. Their language — Assyrian — is related to the language Jesus spoke, Aramaic. But their connection is not only the ethnic group and language. When Father Adday was a child, his village in southeast Turkey was burned during the Kurdish-Turkish conflict. He and his family had to move to Istanbul. That is another reason that keeps Father Adday on the road with the people. “When you leave your sheep in the mountain, you don’t know what will happen to them. But when you are with them it is different. You can show them where the water is; where there is a good place to stay. They are like children waiting for their father,” he said. After two intense days and one night in Kirsehir, Father Adday prepared to return to Istanbul. He celebrated five liturgies and visited multiple families, but he said he was not tired. “I hope that my visits allow them to become more spiritual and in touch with the church, and to refresh their belief in Jesus. Every Christian needs to refresh his spiritual life,” he said. “I also hope to give them hope and remind them ... that God makes miracles, and for that they need to believe. I tell them let God do the working for you. He is our Father and he wants the best for you,” Father Adday said. Gaza risks becoming an ‘easy launch pad’ for ISIS (The Jerusalem Post) Palestinian infighting and years of an Israeli blockade could turn the impoverished Gaza Strip into an easy “launching pad” for Islamic State recruiters, Qatar's foreign minister says. African ant colonies pose threat around Christian churches (CNBC) The ant colonies are in the forests that surround Orthodox Christian churches in Ethiopia, which are some of the last natural forests in the country. Ethiopian Christians have long surrounded their churches with woodland. Some of these forests are more than a thousand years old, and are unusually rich areas of biodiversity in areas otherwise barren or deforested for agriculture. At St. Mary’s, a Byzantine Catholic church in Kingston, Pennsylvania, parishioners make peroghi. (photo: Cody Christopulos). Read more from the January 2005 edition of ONE.